One man, his wife, 2 children, a grandad and his dog! In the weeks leading up to our holiday we had been preparing for the biggest challenge we have ever set our girls and Cookie. We had a dream to climb Scafell Pike the tallest mountain in England and one of the 3 most well known mountains in the UK. In all honesty we actually thought we would just admire it from afar and not actually make it to the top. We had built up to it throughout the week tackling some pretty hard walks across Eskdale where we were camping (I will cover these walks in another blog). We set off ahead of Mark and Mel my inlaws to see if we could make some headway before they started the hike to the top… not wanting to hold them back and stop them reaching the top if we weren’t able to. Ok ok this isn’t everest not so much camp but The National Trust Carpark for Wasdale the starting point for our hike to the top. I’m pleased we went with the decision to park here as I knew it was one of 2 options and the other being free but maybe not a good option for a young family not really sure on the route to the top. We had several maps with different choices of trails to follow but starting here meant we got to speak to the guide who explained the route to us… he also gave us a little bit of confidence as he didn’t try to put us off and say we were taking on an impossible task taking the dog and girls up there. By the time we were ready to set off we had actually been greeted by Mel and Mark so we didn’t get the opportunity to make a head start but we said our goodbyes and waved them off up the mountain. The trail was a very obvious stone path for approximately the first 2 miles of the walk. They were steep inclines at times but in reality easier than some of the trails we had already tried during the week. As we had so much rain the day before the river was really fast flowing and the paths had little streams running down them. We reached a river crossing that I’m sure in better weather conditions is easier to see a path crossing it. Our first challenge was to figure out how to cross it. Chris opted to take Niamh and Cookie across where we assumed the path should be but me, Ellie and Steve (Grandad) opted to head up hill a little more to try a path that seemed like a dryer option… we failed and our feet were soaked. 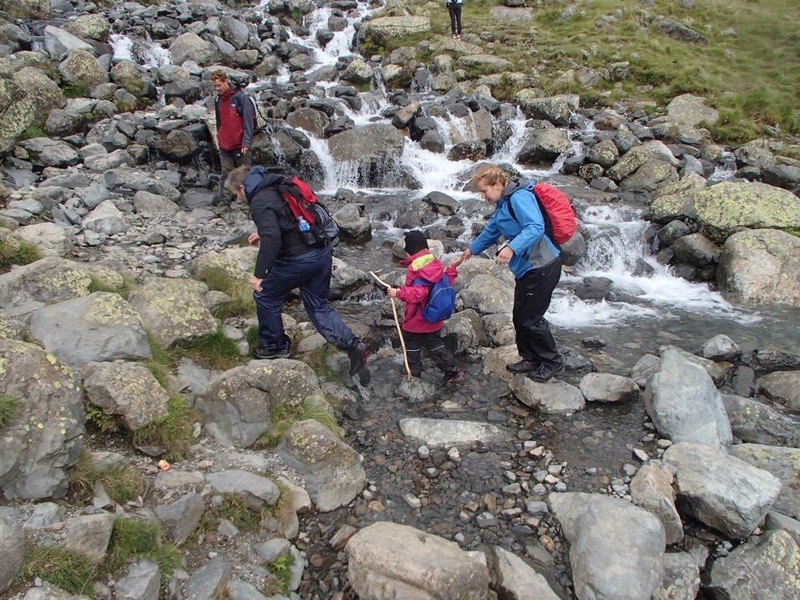 Niamh had been the lucky one as Chris carried her over sacrificing his own dryness as the water came high above his ankles. Poor Cookie didn’t have much better an experience as he was dragged through the freezing cold water to the other side. We then had a steep path to climb and some more beautiful scenery as the top of the mountain was becoming clearer. We had spotted Mel and Mark in the distance so still had them in our sights. At one point we thought they were going a different way but this was just the way the path appeared from where we were. It was a very cloudy day so impossible to see it clearly and it was obvious we would be heading into the thick cloud as we got closer. The girls loved the thought of reaching the clouds and to hear what they thought it would be like just showed me the reality of what this must have been like for them. To think that to them the clouds would be like cotton wool or as Niamh put it cotton candy that she wanted to collect on her stick!!! The nice carefully laid paths began to disappear and we realised soon we would be clambering over rocks… and this could possibly be the end of the journey for us as we had been told at this point it may be too hard for Cookie to carry on not to mention the girls may have had enough…. but our spirits were lifted when we were reunited with Mel and Mark who equally were pleased we had reached them as they had taken a wrong turn and were on route back on the right path but close to calling it a day. We all had the enthusiasm to finish it together which is exactly how I had originally hoped it would be….the girls had a boost of energy seeing them to keep on going. The last stretch to the top was the hardest. Once we had got through the first bit of rock climbing we were relieved to see a more obvious path but this was short lived. We did a compass check as the lake started to disappear from sight. I knew the top was close but when your climbing over rocks half a mile is like 10… especially when you can see very little. The clouds were thick and it was hard to see very far ahead. Niamh and Mark were powering through the last stretch and she was loving the excitement of it all. No fear unlike her little sister who was starting to look tired but not showing any signs she wanted to give up… we were so close none of us wanted to stop by this point. We all climbed our way to the top… Niamh had reached it first with Mark followed by Ellie and me and soon after the rest joined us and for a few minutes we were all the tallest people in England. The girls found this very exciting… I’m quite sure Cookie had the biggest achievement of us all because I can’t imagine too many Bichon’s have reached the top. Like being in a freezer I have never been so cold or experienced windy conditions like it. Ellie did start to cry and was scared to leave the step she was sat on. Thinking it was because she was so cold and because we couldn’t see very much but I later found out it was because she thought we could fall off. Another reality check that in her world the top of a mountain is a pin point that you can walk right off of. Ellie started to relax once she knew we were heading in the right direction and could see as the clouds were starting to clear. We were still so cold though and very hungry. We had planned to eat at the top but the reality of that was so obviously not going to happen so cold hungry and desperate to sit down we raced down the first bit of the decent to the top of the path leading to the lake below. If you ever decide to climb Scafell and it looks as though its going to be cold at the top layer up before not after you get there. We were so keen to get there we didn’t think to put our jumpers back on. Chris carried Cookie for a short way while we assessed the damage and warmed him up but he seemed keen to walk and get himself to the bottom. As we were going down we past a dog who had rubber shoes on… such a brilliant idea! And a doggy coat would have been ideal too. We soon reached the river crossing and this time me and Ellie just walked right through it knowing we would likely get wet anyway we didn’t want to waste time trying to avoid the inevitable. Niamh had ben lucky enough to be carried again while poor Cookie had to walk through it. We reached the bottom excited and amazed that we had actually done it… We climbed a mountain when the odds really were against us… For me it was fairly easy! Much easier than I thought it would be but for the girls and Cookie it was a massive achievement. Cookie had not given us any indication that his feet were sore or tired and the girls had powered through the tiredness determined to finish. This is definitely one of those experiences to cross off your bucket list. We have even more determination to continue with challenges like this for as long as the girls will let us. Watch out Ben Nevis we have you in our sights. We vlogged our journey to the top which you can watch here.. I have so many photos I have put them into a slideshow to share with you all. I hope you enjoy them.